I am taking a tiny break from the 1929 Photoplay Cookbook to prepare a recipe from a star who was the very essence of the 1910s. After all, the mid-‘teens were the age of the vamp and no vamp was more famous than Theda Bara. Bara was surrounded by hype (the studio publicity department was shameless) but from interviews and anecdotes, she seemed like a lovely, down-to-earth woman who didn’t take herself too seriously. Bara hit it big in the 1915 film A Fool There Was, in which she seduces a married man and drives him to his death. If the film had been made 20 years later, Bara would likely have been obliged to fall off a cliff or something but this was 1915 and she laughs and sprinkles rose petals over his body instead. This was heady stuff and Bara became a phenomenon. She played famous seductresses like Carmen, Cleopatra and Salome but she also ventured into sympathetic roles, such as Juliet and the lead of The Two Orphans, which was re-adapted later as Orphans of the Storm with the Gish sisters. If I make few remarks about the quality of Bara’s acting, that is because there are not many people alive who can do so. Theda Bara has one of the lowest film survival rates of any major star. We have her breakout hit (A Fool There Was) and her last feature (The Unchastened Woman). Cleopatra, her mega-hit, only has a few fragments to its name. East Lynne (1916) survives but it is more of a morality melodrama than the sort of over-the-top vampishness we crave. Other surviving film elements include fragments, lone reels, shorts, walk-ons and cameos but complete surviving features in which Bara is the star? Rare as hen’s teeth. So, we can see very little of Bara’s work but let’s taste the sandwich that she inspired. In 1916, Photoplay magazine published a collection of sandwich recipes that were said to be based on the screen personalities of the biggest female stars. What will Theda Bara’s recipe taste like? The type of bread is not specified (most of these recipes are very specific about the type of bread and how thick the slices are to be) so I chose a good swirled rye. I figured that this combination of flavors called for a sturdy, flavorful bread to support them. Sweet pickles were another matter. I hate them with a passion. Therefore, I bought the cheapest jar in the store. I’m sure Miss Bara will forgive me. The recipe gives a very specific order for everything so here we go! I lightly toasted and then cut the bread into heart shapes because I am not a savage. Step one: the minced ham. I think we moderns have a better grasp of these things. Mayonnaise THEN minced stuff. And now for the pimento. And the (shudder) sweet pickles. Pop a top on the sucker and we’re done! Time for the taste test video to reveal all! Score: 4 out of 5. Considering that I hate one ingredient and dislike another, it’s pretty surprising how tasty this sandwich is. The flavors blend together nicely, the saltiness of the ham, the sweetness of the pickles and the mayonnaise holding everything together. The rye bread was a good call as I doubt that the sandwich would have tasted as good on plain white bread. It’s a substantial sandwich with plenty of flavor. Made full-size, this would definitely be a filling lunch. 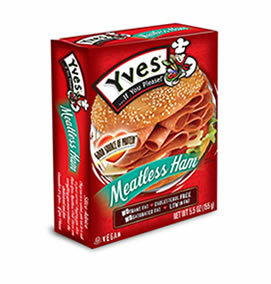 It can also easily be made vegetarian or vegan by substituting soy bacon or ham and using vegan mayonnaise instead. All in all, this sandwich does Bara proud. Now excuse me, I have this sudden urge to line my eyes with black and strike dramatic poses. Even my local (non-vegan) supermarket has a nice variety of vegan and vegetarian options. This sandwich can survive a lot of tinkering, I think. Enjoy! I had a friend who was OBSESSED with sweet pickles. I had cheap ones, expensive ones and everything in between. It didn’t make a shred of difference so I opted to save some coin. I can definitely see this being a good grilled sandwich. Maybe with some havarti cheese to keep things together. Yes, this could be a very nice sandwich on Texas toast. Open-face perhaps? I would totally eat this. And the rye sounds like a really good choice as well. Yum. I think I could try this one. Pimentos and sweet pickles are not something I normally buy, but I can buy small jars of each one. I definitely have ham, rye bread and mayonnaise. It might be good to have something different to do with ham. I wonder if all of the ingredients could be mixed together as a kind of ham salad or if they’re better off being separate? I think a salad should work out fine. My only concern is that the canned pimentos may disintegrate as they are fairly soft. You could always add them whole to the sandwich or perhaps use fresh red bell pepper in the salad since it is sturdier. This sounds good! I’ll have to give this a try, but I’ll need to find some kind of gluten free substitute for the rye bread. The pimento/sweet pickle combination sounds intriguing! This sandwich has strong enough flavor to work as a topping, if you want to go for rice or quinoa crackers. Canapes for all! Fritzi, your website never fails to make my day. This sandwich actually sounds and looks pretty good. My mom used to make a sandwich with chopped up ham and dill pickles, but you didn’t “sprinkle” on the mayo, you mixed it all together. This was back in the 1950’s, she made some real strange stuff sometimes, some that would probably rival those of the Stars. i wonder if Theda’s sandwich was the forerunner of Pickle and Pimento Loaf lunch meat, she would have loved that! I’d love to have a party sometime and just exclusively use the recipes of “The Stars”, I’d have to invite people with a good sense of humor and STRONG stomachs. Yeah I think it would be a good idea to encourage guests to eat before they came to the party. After they arrived,they would understand why.